Located in southern Romania, in Valcea county, Baile Govora, one of the largest spa resorts in the country, is known for the healing properties of its waters. Stay tuned to find out which the most sought after treatments and the main tourist sites in the surroundings are. 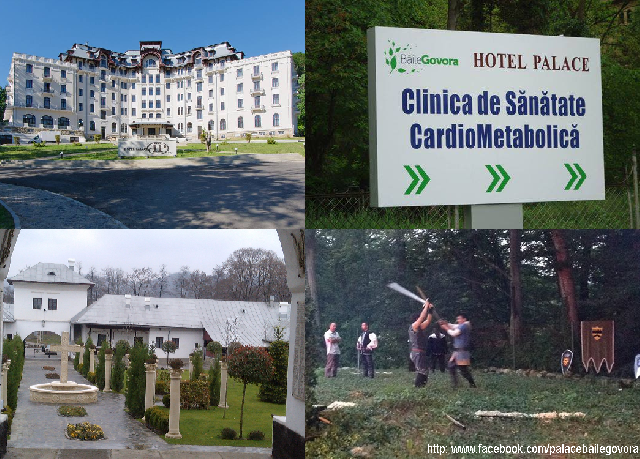 "This is the only spa resort in Romania and seemingly in Europe as well, whose air has a balanced density of positive and negative ions. The air in the region is very pure, and the people who come here for treatment or entertainment will have a firsthand experience of its action and results. I would also like to mention the region's mineral waters, which help improve and even cure asthma. From this point of view, Baile Govora spa resort is one of the best in Europe. As to entertainment opportunities, I would like to mention the spa resort park and its alleys measuring 7 km. The park was built by the French landscape architect A. Pinard. The tourists who come to Govora can also visit the monasteries in the neighborhood. Another special tourist site is the Ocnele Mari Salt Mine which is 10 km away. It is located 200 meters below sea level. We also recommend a visit to a famous wine-growing area of Romania located in the neighborhood, Dragasani." "It is a historical monument built between 1911-1914 in a wonderful place, with a spa treatment tradition spanning more than 100 years. It was the first hotel with such treatment facilities in Romania, built after the blueprints of French architect Ernest Doneaud. In order to have a lighter construction, the walls were made of corkboards. The building has 365 windows and doors, symbolizing the number of days in one year. People come here for treatment of respiratory and rheumatic diseases." "The center has several areas for relaxation. There is a Kneipp therapy area, two saunas, one with infrared heaters and the other with steam, a hamam, a shock shower, an ice bucket, swimming pools for both kids and adults as well as a Jacuzzi. The spa also provides several types of massages and wraps in sapropelic mud. We recommend our guests to visit the surroundings, the Baile Govora park as well as the highest-altitude road in Romania, Transalpina, also known as the King's Road." Elena Rădescu, chief nurse at the spa and physiotherapy center, says that Baile Govora spa resort stands out among similar resorts thanks to its natural therapeutic factors, namely mineral waters and climate. "Thanks to its natural factors, the spa resort specializes in respiratory diseases and locomotion disorders. People come here to treat chronic bronchitis, asthma, tobacco bronchitis, chronic obstructive pulmonary disease, allergic rhinitis, sinus inflammation, laryngitis, pharyngitis and tonsillitis. Many kids have been treated in Baile Govora spa resort. Thanks to mineral water therapies, kids recuperate very well and become more resilient to respiratory diseases." "We have a patient who comes from California twice a year for spa and physical therapy. This patient has recuperated very well, his condition has improved thanks to his perseverance. He has come for 5 consecutive years. To obtain an improvement of one's condition, one needs to come for treatment for at least 3 consecutive years." We hope we have convinced you to come to Baile Govora, and don't forget to participate in RRI's ongoing contest devoted to Baile Govora.